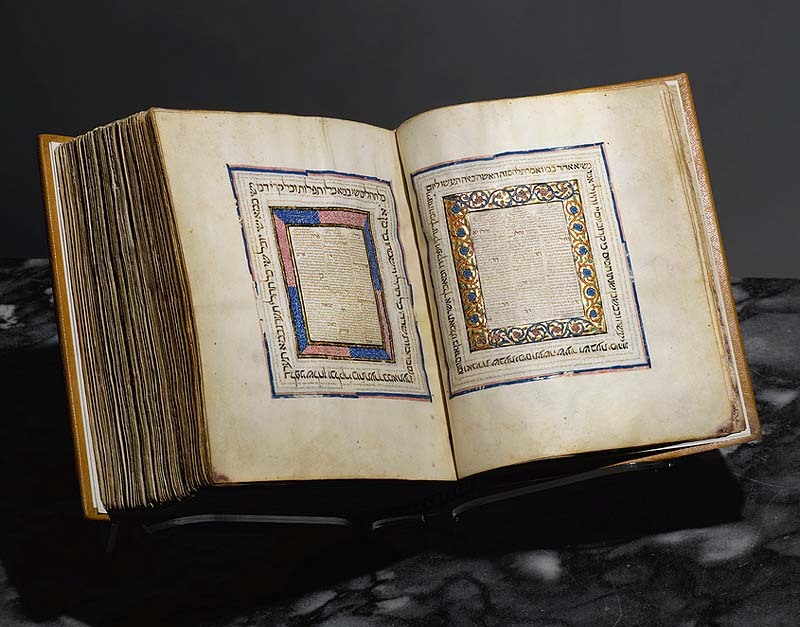 Sotheby’s New York will auction on December 20 the earliest known illuminated Hebrew Bible from Spain. Produced in the Kingdom of Castile in the first half of the 14th century, the illuminated manuscript is an exquisite example of the cross-cultural influences in the Golden Age of medieval Spain. The artifact coms from the J.E. Safra collection, with the yield expected to be between $3.5 and $5 million. According to Sotheby’s, this illuminated Hebrew Bible is one of only three complete, decorated Hebrew Bibles from Spain to come to auction in the past hundred years, and one of only six in private hands. The manuscript comprises the full text of the Bible, with lavishly painted borders and richly patterned micrographic decoration (an embellishment whereby an expert scribe fashions minute script into ornamental patterns). The Sotheby’s website notes that the blend of Gothic and geometric designs selected to adorn the text blends the scribal traditions of the Christian North and the Muslim South in Spain. 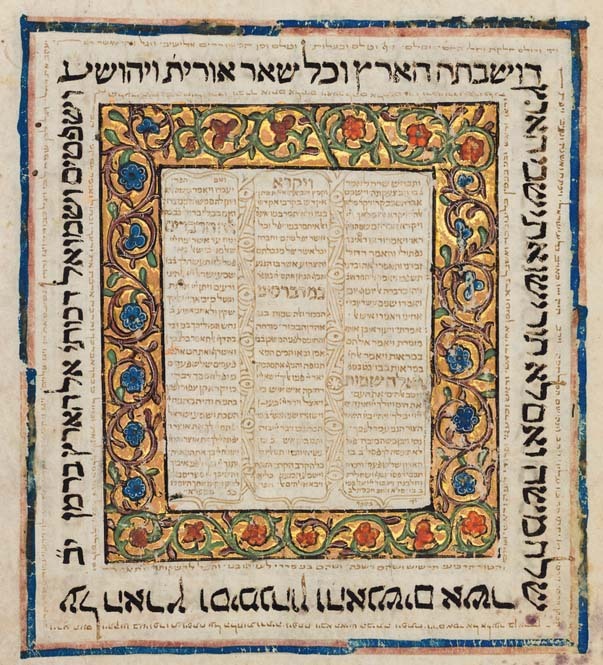 There are 16 illuminated carpet pages at the opening of the manuscript which enclose the text of the Masorah in borders of vine scrolls with petalled flowers in red and blue with raised, burnished gold work alternating with borders of elaborate white penwork tracery on a flat red and blue ground. Each of these compositions is circumscribed within thin, ruled borders in red and blue. Seven micrographic carpet pages at the end of the manuscript each feature two columns of text within architectural frames of horseshoe and double-horseshoe arches embedded within dense interlaced geometric designs in violet, pink, and brown penwork, with whimsical human faces drawn at intervals along the border. And seventy pages with micrographic decoration in the margins that takes the form of interlaced designs with trefoil finials adorn important biblical texts; seven of these are ornamented with full, interlaced borders. With the Castilian and Aragonese conquests of Islamic territory from the late eleventh through the thirteenth centuries, most Iberian Jews came to reside under Christian rule, a more vulnerable condition due to unpredictable and unfavorable laws and attitudes. Jews were protected by the Crown, a tenuous circumstance at best. Still, between the thirteenth and fifteenth centuries, Jews continued to participate in the country’s intellectual and cultural spheres. Jewish scholars had an important role in the transmission of Arabic literary, philosophical, and scientific texts to Christian Europe through the School of Translation that flourished in Toledo under the rule of Fernando III and his son Alfonso X.
Patronage of the arts and Bible production endured and developed, as evidenced by the magnificent examples of synagogue architecture and illuminated Hebrew manuscripts that have survived to the present. A manuscript project of this scope and quality represents the collective efforts of a consortium of craftsmen, artists, and scribes including a parchmenter, a principal scribe (sofer), an illuminator, a vocalizer (nakdan), a masorator (masran), and a bookbinder. Most, but not all, of these masters were Jews. 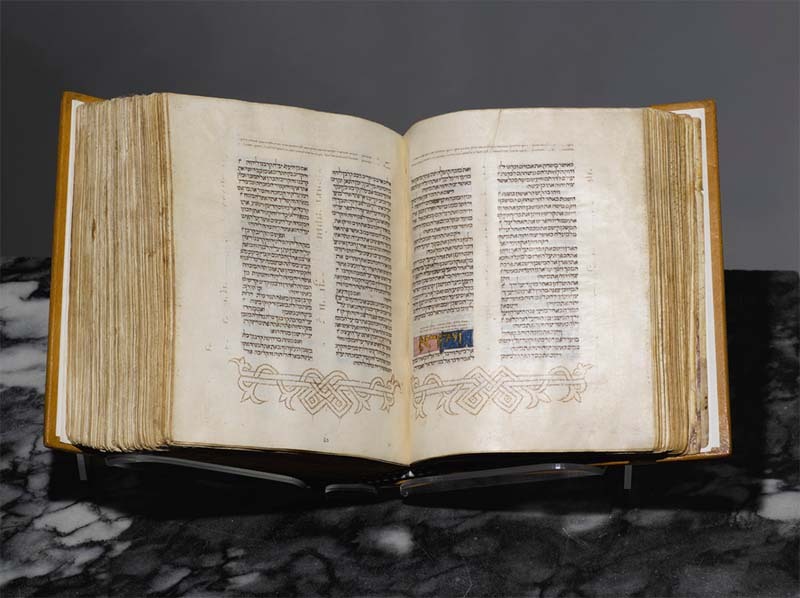 The parchment prepared for this volume is extremely fine, smooth, even, and bright and has no blemishes. Its quality is similar to that used for contemporary fine, European illustrated manuscripts. The main hand is consistent throughout, indicating that the biblical text was copied by a single scribe. The project would have taken a year to complete, based on the account of the scribe, Samuel bar Abraham ibn Nathan, who records in a colophon that he finished copying the text of a Hebrew Bible in the city of Cervera in 1300 after ten months of work while recovering from a broken leg (MS Lisbon, Biblioteca Nacional de Lisboa 72). Once the text was written, the vowels were added by a vocalizer, or pointer, using a very finely-cut pen, in this case in an ink that is warmer in color. (Text courtesy of the Sotheby’s website).